When Rudra was not even a month old he was diagnosed with Congenital Heart Disease, meaning he has a massive hole in his small heart. Congenital Heart Disease is caused at birth and affects that structure of the heart which stops the proper flow of oxygen to the heart. If not treated this can become life-threatening. 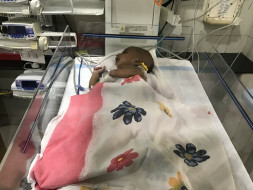 When the family reported to the doctor that he had constant fever and cold, the doctors decided to conduct a heart echo test as they suspected defect in the heart. 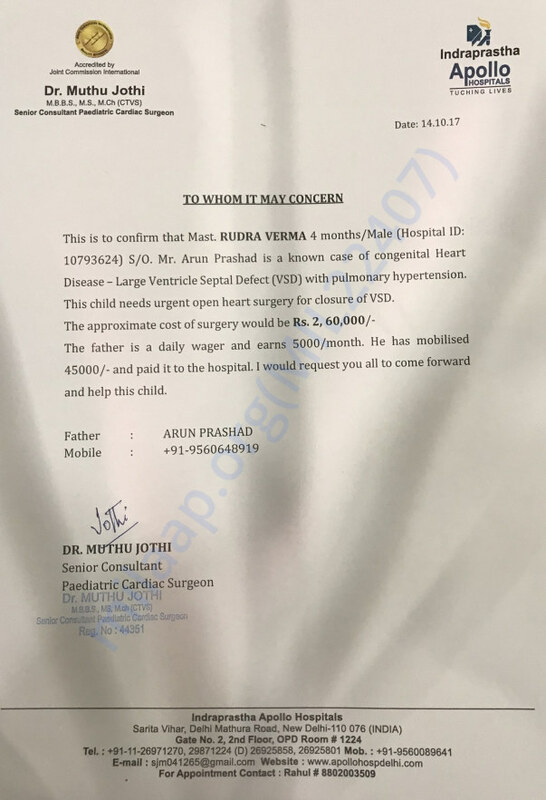 Baby Rudra has been asked to urgently undergo an open heart surgery in order to treat his condition at the earliest. The total cost of surgery and treatment is amounting to approximately 2 lakh Rs. 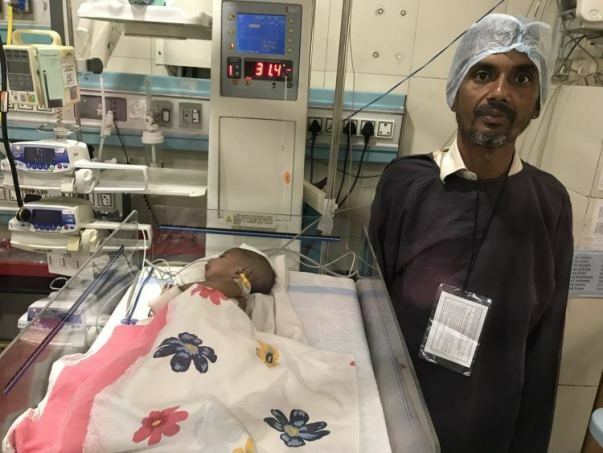 Because of his condition, the baby is not even able to breathe properly. He is suffering from pneumonia and frequently turns blue due to the lack of oxygen. If not treated on time, the baby might succumb to his heart condition. Rudra’s father, Arvind Prasad is a tailor by profession and manages to make Rs 10, 000 per month. His mother, Asha Devi is a home-maker. 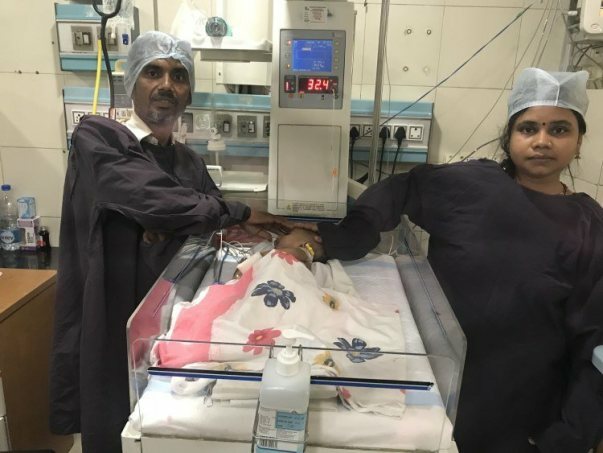 The couple also have an elder son together who recently turned 5-year-old. “We were supposed to put him in school but due to Rudra’s sickness, we had to compromise the elder one’s education. We don’t have the money to look after both their needs. Given the urgency of Rudra’s condition, we decided to keep schooling on hold,” said the father. Rudra is barely 4-months-old and has his entire life in front of him. 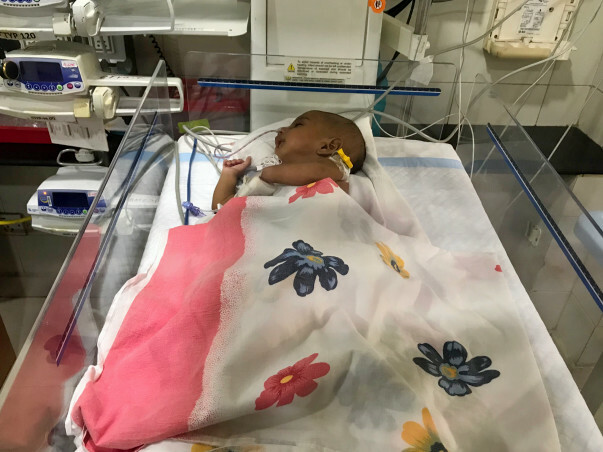 The little one needs to undergo urgent open-heart surgery if he is to live to see another day. Funds raised through this fundraiser will go towards his surgery. Your contribution can help save Rudra's life. Thank you for all the love and support you have shown my son Rudra. He is doing better now and he underwent the surgery successfully on 2nd November. He has no issues breathing now and his health is slowly improving. He keeps on coughing and that is due to cold. The doctors are administering him treatment for the same. Please do pray for his speedy recovery. My only request is please utilize this money genuinely..